In addition to our seasonal reading list we also have Da Chicken Shack’s 1st Book of the Year. 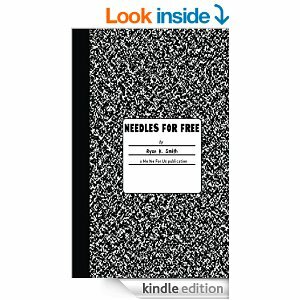 For 2015 we have chosen Needles For Free by Ryan K Smith. This is a very unique story based on true events and written from a manic perspective, inspired by Daniel Keyes’ “Flowers for Aglernod”. The best book of 2015 hands down. We look forward to works by Ryan K. Smith. Ryan K Smith, grew up in Chester, PA and is staff writer for various newspapers and magazines and a contributing writer to Complex, Ebony and Don Diva. Have you ever asked yourself, “What is bipolar disorder?” The term “bipolar” gets thrown around haphazardly, but it is a real disorder that effects everyday people. It is also known as manic depression. ‘Needles For Free’ is a journey through an experience bipolar people know all too well: the manic episode, displaying many of the symptoms of bipolar disorder. The writer takes the reader through mania after a wild incident at a trying time during the main character, Free’s life. He has found himself in the mental ward yet again and keeps a journal. But, is has he really lost it or is actually living in a new reality?